I don't believe it, another week of corset sewing done. Last week felt slow to me, but this week felt like it flew by. Did it feel like that to any of you sewing along? So then time to sew the back facing! Pin the facing to the center back face-to-face. Then sew a seam 1/2 inch from the edge of the seam allowance. 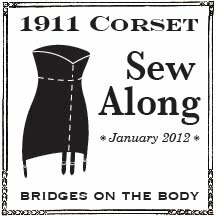 Press open, then trim the allowance on the seam that will be closest to the exterior of the corset in half. Then fold the facing in 1 inch so it just meets the seam allowance. There should be a peak at the top of the facing indicating where to fold. Press, of course. In the picture below you can see how I trimmed the waist tape. When the facing is sewn the stitching will secure the end of the tape in place. It's just over the seam allowance so you can see it, but it really doesn't matter if it reaches all the way to the allowance. Fold the facing at the seam. Press, and sew 1/16 from the edge from the center back of the corset. I sewed these next seams from the interior side of the corset, but they could be sewn from the outside of the corset too. I've done it both ways. Anyway, sew 3/8 inch from the line you just sewed. Then again 5/8 inch from there, and finally another 3/8 inch away. Now we have channels for the bones at the center back and space for the grommets in between. Next week we'll assemble the busk, set grommets and bind the bottom edge! This is rather off topic but I have found a source for both 25mm ad 29mm garter grips. They are available in black or white, as well as sundry other corset goods. They are listed in the Dark Materials section and the address is as follows. I don't know much about garter grips but they look good. Metal, not plastic like the cheap ones on premade bustiers. Took quite a while to deliver (just over 2 weeks I believe) but that's to be expected if you're having things shipped overseas. That's where I got my busk from. :)) It took a week to arrive; I thought it was reasonable. I'll have to check them out for my garters as I have yet to find any that I like.